societies have been ravaged by conflicts. It is not enough to conduct preventive diplomacy. All of this is essential work, but we want enduring results. We need, in short, a culture of peace"
The homage which world citizens can give to the memory of Kofi Annan, the former Secretary-General of the United Nations, is to carry on his efforts for world-wide security and the resolution of armed conflicts through negotiations with the presence of skilled mediators. As he wrote "We must seek new common ground for our collective efforts." World citizens believe that U.N. Member States owe an obligation to each other to make good faith efforts to reach agreements consistent with the highest principles of world law. The United Nations was conceived to do more than to clear away the rubble of conflicts that it was unable to prevent. The relations between security, conflict resolution and respect for human rights have now assumed a more dynamic form than at any other time since the creation of the United Nations. Thus there is a need for concerted attention and action of States and non-governmental organizations (NGOs). Kofi Annan was always sensitive to the role that NGOs could play in building a culture of peace. In 1997, he said that the U.N. should be "a bridge between civil society and governments." He stressed that the role of NGOs was becoming increasingly important. The U.N.'s peacekeeping mandate had changed in that armed conflicts are increasingly taking place within rather than between States. Thus peace-keeping efforts can involve electoral assistance, humanitarian aid, administrative support, and the protection of human rights. 1) Fact-finding and early warning. In preventive diplomacy, NGOs, because of their familiarity with local situations are well placed to play a part in early warning by drawing the attention of governments to budding and emerging conflicts. Yet more must be done to co-ordinate activities to stop violence before it spreads. Coalition building can have a multiplier effect on the ability to understand the complexities of conflict before violence happens. Consultative mechanisms should be developed to enable NGOs to provide early warning information and to receive information from the U.N.
2) Lines of communication. Diplomacy to keep channels of communication open between opponents is a difficult yet necessary task. Often one side will break contact which is then difficult to re-establish. Given its importance, better ways must be developed to communicate and, if desired, to pass on communications from one side to another. 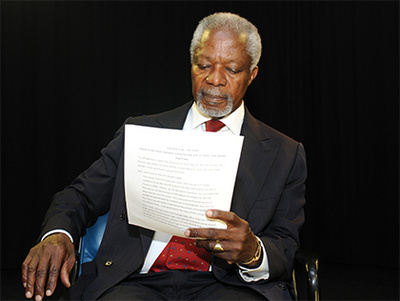 Kofi Annan was a model of calm networking and keeping lines of communication open. We need to continue in his spirit.